Released On Friday 19th February 2016. Stories In Trance offer up SIT 133 by Vince Schuld with the three track Satellite EP, including Satellite, Put Me To Sleep and Departures. The talented American producer backs up his most recent remix on SIT, Vaali's Say Something (SIT 132), with this superb three track EP. Up first is the title track Satellite. 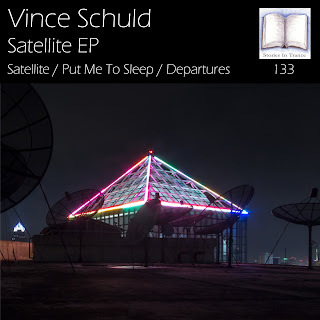 Vince showcases the full gamut of his musical talent with this brilliant original production where he also provides the vocals himself. The strong lead melody is perfectly complimented by the vocals that add a real sense of drive and emotion to the overall feel, underpinned by excellent melodic progression and deep rich lows making this a diverse and creative track. Second on the EP is Put Me To Sleep, and once again Vince lends his vocal talents to this creation. A powerful dark track, the vocals add a truly atmospheric feel to the piece, expertly supported by fine melodic evolution this is a real stand-out production from this multi talented artist. Finishing off the release is Departures, and as a departure from the other two tracks on the EP this is a non vocal production. An overall uplifting style is evident throughout, as the track progresses it builds into a euphoric epic. Instantly attention grabbing effects and beautiful piano layering put the finishing touches to this fantastic production. With Vince taking centre stage in this EP, his great potential is immediately evident as his creative and expressive efforts come to fruition. Vince continues to play a bigger and bigger role at SIT, so no doubt there'll be exciting times ahead for him and us with releases of this quality.